Trinity Candle Factory Premium Scented Clove Spice - Pillar Candle - 6x3. This 6x3 Pillar Candle is premium scented for maximum fragrance throw. With a 150+ hour burn time, cotton wick and premium scent, this candle has 3 wicks "The Original Trinity Candle" and an absolute must. This Clove Spice candle smells like bold, spicy freshly ground cloves. A classic traditional fragrance and great for the holidays. 100% Satisfaction Guarantee. I gave these candles as a gift and they have been received with nothing but the highest compliments regarding the wonderful fragrance of cloves. These were the perfect gift! Now, I will be ordering for myself soon. Thank you very much for my recent order. 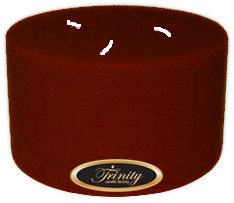 I chose Trinity Candles for my order of the clove scented candles because they are exactly what I like about the fragrance. I love the spicy smell it leaves in my house. I smelled the spice when I picked up the package after delivery. Thank you very much. I will definitely be ordering from you again in the future. Your service is excellent.